Check out this 56-inch-tall model of Erebor made from 80,000 pieces of LEGO! You might recall that we’ve previously profiled the incredible Middle-earth LEGO dioramas of Blake Baer here on TheOneRing.net. Now he’s back with his biggest piece yet — a 56-inch-tall model of Erebor made from 80,000 pieces of LEGO that weighs close to 200 pounds! This time he’s working with fellow LEGO aficionado Jack Bittner. When we saw the first movie last year, we loved it too much not to build a scene from it. Of course, we couldn’t build any thing less than the iconic dwarf city. So here it is, our third and latest collaboration (our first was Amon Hen, our second was Rivendell). 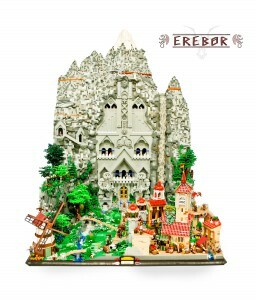 We chose Erebor for many reasons, not the least of which was that we love building mountains [sarcasm]. This build was a ton of fun, and we hope you enjoy it. And now, it is our pleasure to present Erebor, the dwarven hall of kings. TORn: How big is it? Is it your biggest yet? 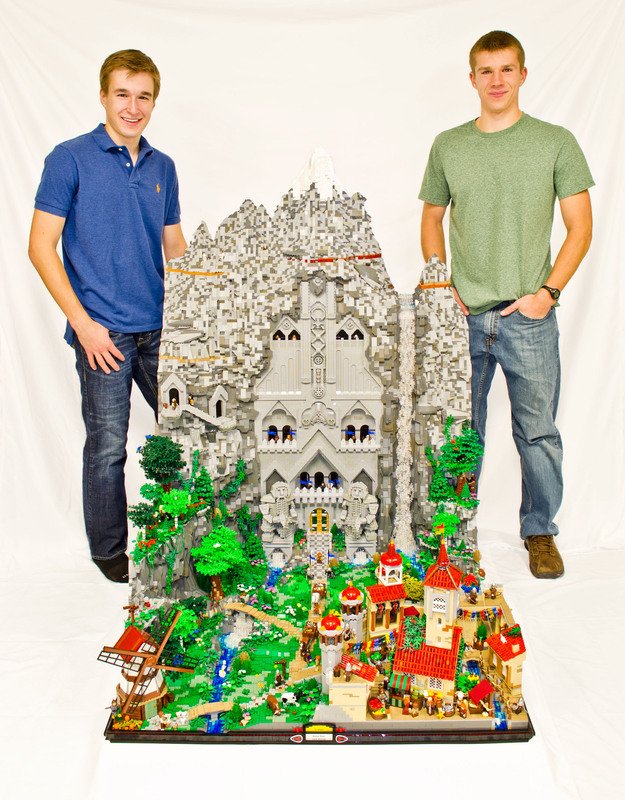 Blake: It most certainly is our biggest yet at 56″ tall, and close to 80,000 pieces totaling close to 200 pounds of LEGO. TORn: How long did it take? Blake: It took my friend Jack Bittner and I close to 400 combined hours to get the model designed, built, photographed, edited, and uploaded. TORn: How difficult was conceptualizing the design? Blake: We had the movie to rely upon for reference, so a lot of the design stages was just us watching the movie, haha. It obviously isn’t an exact replica, but it captures the essence of Erebor. We had the general layout of where we wanted Dale, the rivers, the mountains, etc. to be, but much of that changed as we built. We didn’t work off of any blueprints, so we were converting directly from imaginations to bricks, so many changes occurred. TORn: What inspired the concept? Blake: Large amounts were drawn from the movie portrayal of the Hobbit. The style of the facade of the gates of Erebor, for example, were drawn from the movie. In addition, representing Dale as a Sicilian-style city with terracotta roofs was drawn from the movie. TORn: Will you be showcasing it anywhere? Blake: We currently don’t have any plans to put it on display, but we hope to keep it together for a while so that we can possibly take advantage of any possibilities that may arise. The public unveiling was at Brickfair, VA, earlier this summer, but Erebor hasn’t seen any action To get an idea of the scale, check out the photo below that Blake supplied us. Amazing! You can see even more photos of Erebor by Blake and Jack on their Flickr account.